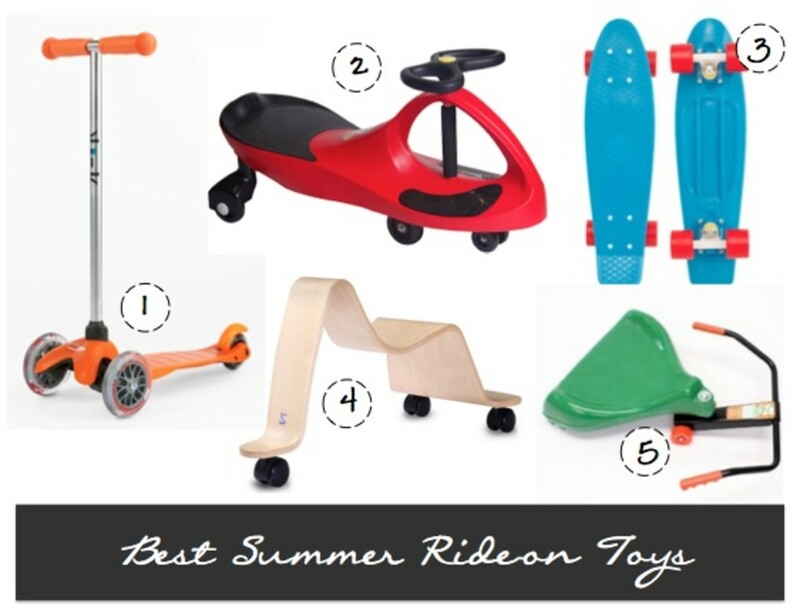 Whether you&apos;re riding to the park, scootering down to the corner ice cream store, or going for a family walk around the block, I&apos;ve rounded up some of my favorite scooters, skateboards and other ride-on toys to keep your kids zipping through the summer heat. 1. Kickboard USA - These are some of my all-time favorite scooters. We&apos;ve used the Mini, the Maxi, Micro White, and the Micro Flex which have all been a huge hit. The Kickboard USA scooters are stable, sturdy, durable, lightweight, and have a long use range(one of my sons rode his Mini from 18 months up until he was 4). We use them for walks around the block, trips to the store (even in the store sometimes! ), camping, and on vacation. While I love the 3-wheeled versions, the 2-wheeled Micro Flex and Micro Sprite fold in half making them super convenient for packing and travel. Check out their website for their complete selection of scooters for toddlers, teens and adults. Buyhere. 2. Plasmacar - If you&apos;ve never seen one of these wiggle riders, you&apos;ll have to check out the video below. While they definitely are easier to use on flatter terrain, the design allows you to go forwards, backwards, in circles and up slight inclines by just wiggling the handle back and forth. We used ours inside when the boys were little and outside later on. It can even hold an adult and a child together and, dare I say, is pretty fun. Buy here. 3. Penny Skateboards - These mini skateboards are one of the hot items my kids are jonesing for. At only 22 inches long, Penny skateboards are smaller and lighter than a traditional skateboard making them perfect for kids. They come in a variety of colors include florescents, pastels, marbled, and organics - you can even customize your own Penny board! Each board does come with an important warning to heed: "Please note, purchasing this skateboard may result in overwhelming radness." Consider yourself warned. Buy here. 4. Svan Scooter - Sadly, it looks like they like may be discontinuing this designer scooter from Svan, but I found some still available at Modern Nursery. Carved from a single piece of bent birch wood, this scooter is as gorgeous as it is functional. While it&apos;s geared more for indoor use, it&apos;s suitable for kids 18-36 months and something you won&apos;t mind leaving out in the living room when company is over. 5. Flying Turtle - I first saw these wheeled saucers at my son&apos;s school. Kids were all smiles flying around a makeshift course in these Flying Turtles. I love that they are compact and easy to store, can be used by kids ages 3-12, don&apos;t have any electronics or bells and whistles, and are simple for kids to use - even if your child isn&apos;t the most coordinated. Buy here. What&apos;s your kids&apos; favorite way to scoot around this summer? Momtrends was not paid for this post. This post may contain affiliate links.